Our new and improved Breastmilk Storage Bags are perfect for mums to store breastmilk in the fridge or freezer, lying flat or standing up. NEW! 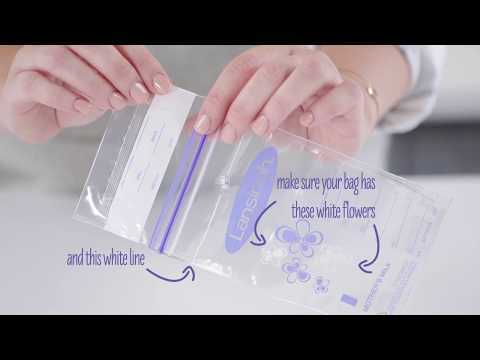 You can now pump directly into our Breastmilk Storage Bags from any Lansinoh breast pump, just ensure that your Lansinoh Breastmilk Storage Bag has white and purple flowers and a white line above the logo. If your bag does not have this design, it is not compatible with pumping directly into the bag. They’re a great way (if possible) for mums to create a bank of breastmilk that can be stored until they are needed, and because they are made from polyethylene they are food safe which means no toxins will reach the breastmilk. The bags now come with a hygienic tamper-evident and secure tear away top along with the write on tab making it easy for mums to keep track of how long the breastmilk has been stored. Lansinoh’s Breastmilk Storage Bags are ideal for storing expressed breastmilk in the fridge or freezer, and now come with a hygienic tamper-evident and secure tear-away top, with a double seal to prevent spills or leaks. The bags also have double-sealed side seams for extra strength, and are pre-sterilised and plasticiser-free, they’re also BPA/BPS free so no harmful substances can contaminate the stored breastmilk.